I don't know how you can actually see the elements previewed here - it's such a mish-mash. In any case there are 33 files in this element pack, about 26 MB. I've offered them in two downloads - 2A and 2B. 2A is mostly ribbons, bows, borders, and flowers. 2B contains the frames, a few more ribbons, and the word art. I'm becoming very lazy in my old age. I didn't want to do two previews. 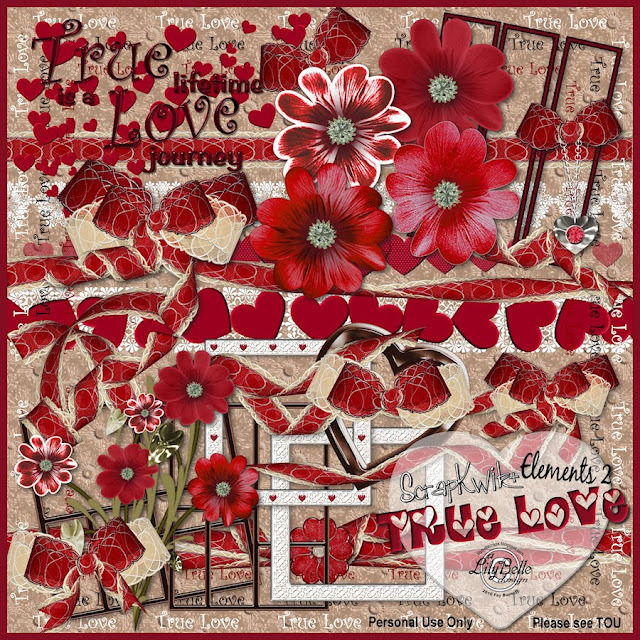 myscrapbook says: Love the true love elements and QPs. The preview is great. thank you for sharing your designs. Much appreciated. I really love the red flowers. They are gorgeous!! Thank you for sharing such a lovely kit. This kit is so lovely, wonderful job on the elements, thanks so much. Thank you so much for this Freebie. I want to let you know that I posted a link to your blog in CBH Digital Scrapbooking Freebies, under the Page 7 post on Feb. 25, 2010. Thanks again. Thank you! This blog post will be advertised on CraftCrave in the DigiFree category today (look for timestamp: [25 Feb 01:00pm GMT]). Thank you so much for this beautiful kit! The reds are so pretty and I love the lace! These are beautiful also! Thanks so much for sharing! It may be a mish-mash, but it's a beautiful mish-mash :-)! Thank you! Thank you so much! This is lovely! Thank you for all these beautiful elements!